This week, our church had VBS. Michaela and Madelin were thrilled to go every morning. While they were away, Molly and I had a few fun outings....coffee with friends one morning and a lovely playdate as shown here. Molly is sitting with Julianna and her sister, Jordan. We went to their house for fun. Molly and Julianna are 5 weeks apart. I was thrilled that my friend Michelle was pregnant the same time as me so our babies could be friends too! Michelle has older kids too that are friends with my older two!! 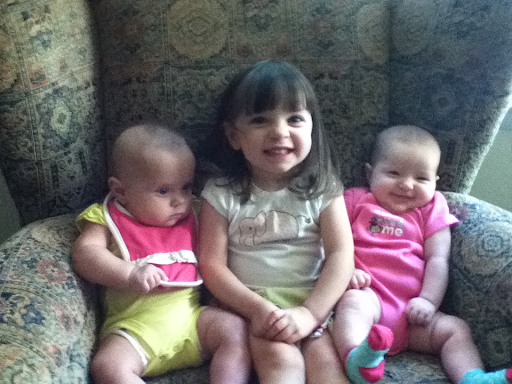 Anyway, these three cuties on the couch had fun together while their older siblings were at VBS.